ZillaConfig is a tool that makes configuring your Zilla Controller easier. It also allows you to save configurations for backups, and alternate configurations. It will also create logs of your DAQ data for later use in either Zilla daq format, or normalized .CSV format. Zipped Java Jar - ZillaConfig.zip - Includes installation instructions. To run, it requires a 1.6.0 JVM or newer. Command line "java -jar ZillaConfig.jar" from the directory where you unzipped it. Updated to new Serial Port drivers - YOU MUST UPDATE YOUR INSTALL! Make SURE you copy the new Serial Driver binary to your JRE/bin directory. Added AH/WH Accumulators that maintain counts between runs. Added Warning/Error settings to Indicator and Number gauges. Fixed several bugs with File choosers. Added Background Image support to Dashboard. Added command line options, -Dashboard, -Daq, -? Bug Fix - Problems with AH/WH in Dashboard. Added option to force all dashboard controls to be use constant data and be visible. Make Dashboard gauges default to more reasonable values. Added Config file name to title bar. Disable File Open/Save/SaveAs/Recent when in DAQ mode. Prompt to save changes before exiting. Fixed bug when exiting app while in DAQ mode. Added Log to CSV option in DAQ mode. 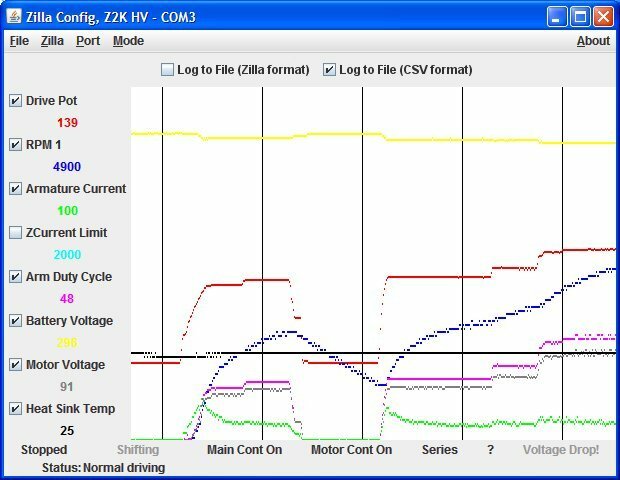 CSV data is normalized to be Volts, Amps, RPM instead of Zilla raw data formats. Bug fix - had parallel and reverse motor settings switched. Re-arranged controls in Config screen to be easier to use. Added more error checking to values. Added DAQ mode, can both display and create a DAQ log file. Updated ZIP file to have everything in a ZillaConfig directory. Cleaned up Properties file settings. 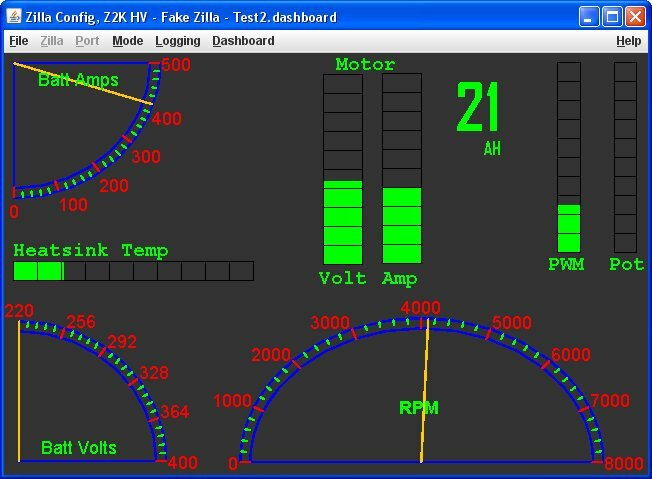 Added menu to choose Zilla model, sets max voltage and current allowed. 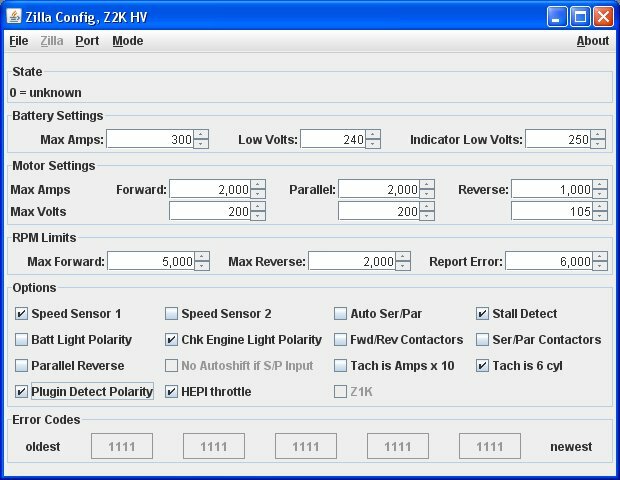 Corrected handling of Z1K scaling option so correct values are set.